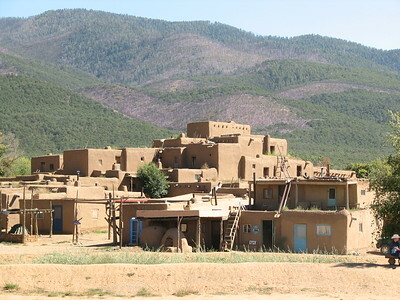 Taos is the best preserved northern pueblo, a traditional type of architectural ensemble from the pre-Hispanic period of the Americas, and has been in continuous use for human settlement until now. It gives testimony to the culture of Pueblo Indians, that developed after the disappearance of the Anasazi tribes in the region. The Pueblo settlements date from around 1400, and have survived retaining their original layout. The Pueblo de Taos is closely related to three other pre-Hispanic sites in the wider region: Mesa Verde, Chaco Culture and Paquimé (just across the border in Mexico). However, the others are from the earlier classic period and are now only left as archeological sites. When you arrive at Taos Pueblo (just north of modern Taos), you are confronted with a gate and a big parking lot at the entrance of the town. As it is both a historical site and there are still about 150 people living here, it's kind of a working museum village. You have to pay an entrance fee for yourself and your camera to get in (10 + 5 dollar). Despite the worries stated in Paul Tanner's review below (his visit dating from 1963), it has not become too commercialized however in my opinion. People keep their distance, and there are large parts of the town and the surrounding grounds that are only open to locals. From pictures I had seen I imagined that the Pueblo would be on a hill, but it turns out to be a flat square with two large building structures on either side (the North House and the South House). These are all individual living quarters that share walls. Entrance used to be via a ladder from the roof. The pretty San Geronimo church also is on the central square. Some locals were just adding a fresh layer of white and beige paint to its thick adobe walls. Catholicism has clearly been incorporated in contemporary Pueblo culture. I roam around between the houses for a while. You can't go very far: many places are restricted areas. It reminds me of Mali: the simple adobe buildings, the harsh sunlight. Or I Sassi di Matera. There's no electricity or running water here. The water for daily use comes from the small stream that crosses the central square. Drying racks (for meat and corn) and ovens (for bread) can be seen outside. It's amazing (and brave) that this way of living can still survive in the US in the 21st century. When I reached Taos during the Memorial Day weekend, I was extremely shocked to see congested traffic in the town because of many tourists; I was really worried that my visit to Taos Pueblo will be ruined with chaos of sightseers. However when I reached Taos Pueblo area, the road become dirt and the whole area were obscured by small sand storm. When I managed to reach the car park outside the village, I was surprised that the car park was almost empty! After waited inside the car until the sand storm gone, I got out and met by the guards who told me to buy ticket at the office opposite the village main entrance. After paid $16 I got a pamphlet which has small history of Taos Puebla and village map, no ticket or inspection at the entrance. According to the pamphlet, Taos Puebla, the Place of the Red Willows, is the oldest continuously inhabited community in USA and the first living World Heritage Site. Judging from the old buildings I saw, I was quite understood why they claimed to be the oldest, but to be the first living WHS was really questionable since I did not understand what that means. The first thing I saw was the ruin of San Geronimo destroyed by US army in 1847 and cemetery showing that this place was not a peaceful village throughout the history. Then I saw the current San Geronimo Chapel, the church was fine, but I think it was too different from the other part of village. I crossed the Red Willow Creek that separated the village. It was interesting to find out that the level of water was actually higher than normal ground and small dyke was need to protect the village. I walked around the south Pueblo, that some adobe had been converted to local art shops, the buildings in this area were quite bit decayed. Then I crossed the creek again to northern side. This area has the best preserved pueblo and the one that looked really complex with three floors adobe, and in my opinion the most beautiful and photogenic one. Sadly that many areas in the village were closed to the public especially the sacred kiva. I continued my walked and saw many abandoned houses and some already collapsed. 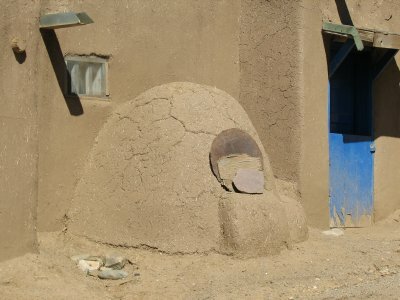 Before I left the village, I decided to try local bakery because I saw many mud adobe ovens in the village, and really tempted to try its baked bread and puffs. With surprised the bakery product were very good deserved its price. I asked the baker who also made wooden fridge magnet for souvenirs about the ingredient, and found that he used local organic berries from nearby mountain. I spend 1.5 hours in Taos Pueblo and really enjoyed the place. The village was really unique and well preserved. The most stunning thing was that the place still retained the feeling of authentic village, not an open air museum. I felt a little bit awkward to be in some area as I felt that I may disrupt local privacy. All in all Taos Pueblo was a nice place to visit and the one of the most interesting cultural World Heritage sites of USA. 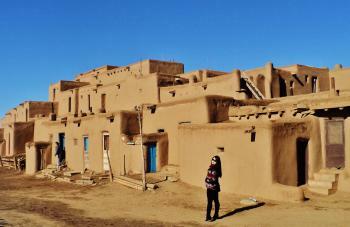 On the morning of November 30th, after a short drive from Santa Fe, my wife and I reached Taos Pueblo. I knew all the particulars about price, pictures, and the general rules. However, I was pleased to learn the photo policy has changed recently. There are no longer any restrictions or fees about general use of cameras within the Pueblo. It is expected that if you wish to take photos of any people, asking permission first is highly recommended. A guided tour is optional, but is certainly worth it. You can explore the pueblo at your leisure before or after. There has also been other positives for the Taos Pueblo community recently. 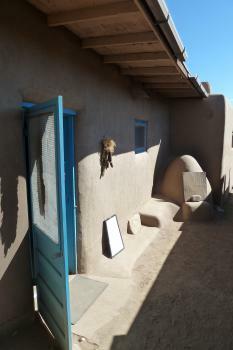 The pueblo has seen a recent increase of inhabitants living full-time inside the pueblo. Restricted portions of the pueblo are primarily areas that lead to 4 traditional kivas that are only accessible to tribal members. There is also a elementary school in the rear of the North section of Taos Pueblo. This school does teach the local language of Northern Tiwa. 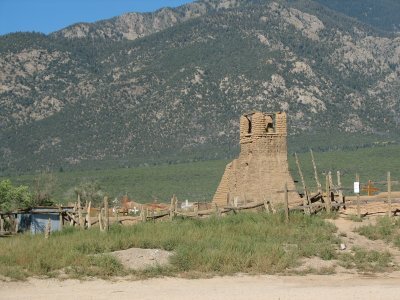 The Taos Pueblo used to be guarded by a more defensive wall, but today it is a very short enclosure. The North side of the Pueblo (Hlaauma) is divided by the Red Willows Creek from the South side (Hlaukkwima). Most of the pictures tend to be of Hlaauma, but using small bridges one can visit the older Hlaukkwima area of the pueblo. (Up tp 1000 years old) My picture is of this area, one can see the general condition of this area is slightly more degraded. The 19th century church near the entrance of the pueblo is a common, but elegant mission. 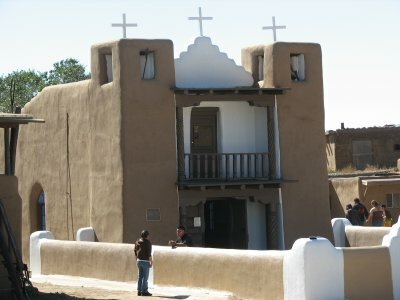 There are several far older and more celebrated missions throughout New Mexico. The original is located near the cemetery and was ruined during the Pueblo revolt in the early 19th century. Most residents within the pueblo make a living as craftsman and artisans. Some homes also sell various food and drinks, such as fry bread. These "shops" are generally located in the front portion of the home, which traditionally was used for the kitchen and storage, the living quarters remain separated. It should be noted, the Pueblo is NOT overly commercialized and these shops are almost indiscernible from other homes, except for an "open" sign in the door and perhaps a small tasteful sign. The entrance for the pueblo is $16 and is very reasonable, despite a small minority of visitors being outraged by this. If the pueblo wants to be economically viable there needs to be a reasonable admission fee. This also helps control visitors. Foreigners expecting Taos residents to be garnered in "traditional" clothes will be disappointed, but this is an unrealistic and largely pointless expectation. Native Americans are not interested in being "displayed" in such a manor. Traditional clothing is reserved for ceremonies, feasts, and for the annual events held at the pueblo. It should be noted that all US Native Reservations follow a similar practice. The gaudy expectation that the locals should be wearing what their ancestors wore 120 years ago on a daily basis is highly inaccurate. In fact, some of the "white" ideas of Native Americans dress were only worn during ceremonies anyway. Daily living clothing was far more simple and unassuming. 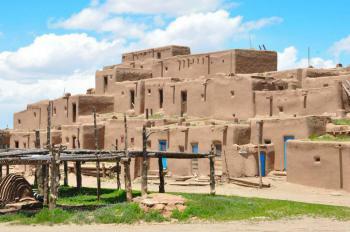 There are 19 pueblos in New Mexico, Taos being the most Northern and the best preserved. Perhaps the 2nd most notable pueblo is Acoma, also known as "Sky City". This pueblo is a national historic landmark and it beautifully located on a mesa fairly high up. Taos Pueblo is truly an amazing place. I have to disagree somewhat with other reviewers. I felt Taos Pueblo was equally worthwhile to visit in comparison to Chaco or Mesa Verde. My wife and I enjoyed exploring the pueblo, taking pictures that are impossible to not look exceptional. The pueblo and the nearby mountains (particularly in Winter) are very photogenic. The shops are also worth stopping in. The quality of the wares are high, and store owners are very polite and unassuming. In the Southwest there are 3 Native American world heritage sites. Mesa Verde, Chaco, and Taos Pueblo. It is my view that these 3 WHS are "world class" outstanding sites. Furthermore, I believe there are other sites in the region deserving of world heritage status. The premier example being Wuptaki, which is located just outside of Flagstaff and is representative of the Sinagua culture. For those based in Santa Fe, enjoy one of America's most charming small cities. The rich history of the city dates well over 400 years. Santa Fe plaza and the cities several high quality museums are the major draw. But I would also recommend a walk in the BARRIO DE ANALCO HISTORIC DISTRICT just 5-10 minutes walk South of the plaza. Here you will find the oldest church in the United States and some 300-400 year old adobe homes. In regards to the town of Taos and Rancho de Taos there are two worthwhile activities. Firstly, there are a number of high quality galleries and historic homes located on Ledoux Street, 10 minutes walk from the relatively cliché plaza. This historic district is the origin of the artistic community that sprung up in Taos at the turn of the century. At Rancho de Taos one should visit the San Francisco de Assisi Mission Church. This mission is found in countless paintings, particularly the austere and geometric back portion of the mission. One of Georgia O'Keeffe's most celebrated works is of this mission. The church is great for photos, and definitely worth a short visit. The site is considered one of the most beautiful missions in New Mexico, and is a National Historic Landmark. 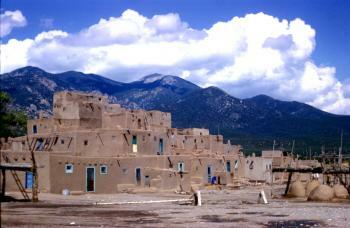 I would highly recommend any traveler to visit Taos Pueblo, and to enjoy the nearby locations as well. In particular, Santa Fe and Bandelier National Monument. The main thing that stuck with me after my visit was how "authentic" the Pueblo was. With the exception of the odd bit of plastic guttering and a portable-toilet there were no discernible traces of modern materials or techniques. Walking on the dusty ground between a few of the crumbling buildings near the cemetery I could easily have thought myself back in a remote village in West Africa. This is actually pretty impressive; there must be lots of pressures to modernise both internal and external, but it is a real testament to the inhabitants that the site isn't just a museum, unlike other historic small settlements on the list. We arrived shortly before a tour was about to start so decided to join in, and I'm glad we did. It was conducted by an informative local who was also studying at a nearby university. It helped to give a resident's perspective on history (and even the concept of history), religion, the functions of buildings, annual celebrations as well as life with-in the pueblo, though many residents also have homes elsewhere in the reservation. I was interested that there seemed to be a begrudging acceptance of being in the USA rather than whole hearted support for it. We had a quick walk around after the tour, bought a few (surprisingly expensive) goods baked in the ovens and took some photos then headed on out. The pueblo is just outside the city of Taos, which I must admit was a massive disappointment. I didn't expect wonders but the ersatz "pueblo" architecture which made up the centre just seemed to hold shops selling sub-par hippy/Native American art. It didn't help that we got stung on parking fees, found DH Lawrence's ranch to be closed (after a 40 mile round trip) and then had some bad coffee on our return. However this did all make our time in Santa Fe much more enjoyable, it actually turned out to be one of the more interesting cities I have visited in the USA. I liked Taos Pueblo; it was a really interesting experience and brought to life an aspect of US history that is often overlooked. Architecturally it is very interesting and has influenced many of the buildings in the South West USA. Well worth a trip, especially if you manage to visit Santa Fe as well. Taos Pueblo is a fascinating place. We drove 1 1/2 hours from Santa Fe to the pueblo, only to find that it was closed for a funeral. Visitors must be prepared for the pueblo to be closed at any time (for weddings, funeral, or other ceremonies). Funerals can take up to four days and luckily for us, we tried to visit on the fourth day. We went back the next day while there were heavy winds and sand was blowing in our faces. It didn't matter; I was determined to see the pueblo. I highly recommend going on a tour provided by one of the pueblo residents, as you get a brief history of the pueblo. Also, if you want to go inside a home, the only way is to visit one of the many shops. There are many micaceous pots (the style of pottery done by the Taos people), drum, horno-baked bread, and other souvenirs for sale. Upon leaving the pueblo, it is worth it to visit the art center run by Marie Reyna and Tony Reyna Indian Shop. Christmas Eve and Christmas Day at Taos Pueblo are among the most transforming experiences of my long life. My husband and I, with my daughter, son-in-law, and three grandchildren, were overcome by the beauty of the church service, the wild glory of the bonfires, and the mystery of the dances. We have also attended the San Geronimo pole climb twice. Another treasured memory: sacred clowns on the roofs of the pueblo, the unparalleled courage of the young men at the pole climb, and, as always, the kind welcome of the Taos Puebloans. culture that dates from approximately 600 years ago. It is very rare to see a culture this old in the USA. In genealogy research for my children's paternal heritage, the Taos Pueblo was welcoming and happy to meet us. In our Class "A" motorhome, we stayed at a new-found elder family member's adobe outside of the area of the adobe apartments. We were there for a couple weeks learning their heritage and having a couple of BBQ's for meeting family. We enjoyed all this immensley. Their hospitality was impeccable. From houses to shopping malls to hotels – indeed, wherever you go in the SW USA you will see examples, from the good to the clichéd, of “Pueblo Revival Architecture”. Its current manifestation is even called “Southwest Architecture”. At Taos Pueblo you can see the “original” article still lived in by “Native Americans”. b. How much you “want to get a feel for” Native American culture and how you react to the circumstances under which such a visit takes place. One must have some sympathy for the inhabitants. What do you do if you live in a village of 150 people where hordes of tourists want to come and gawp at you and your houses? Well you charge them quite a lot of money to come in (at limited times), you make them pay to take photos (and try to stop them taking photos of you because otherwise it gets very wearing), you provide lots of “shopping opportunities” and you restrict what they can do and where they can go (because if you don’t you will find people coming into your house as if they owned the place!). In fact I visited Taos as long ago as 1963 when was probably a great deal less touristy than I suspect it is now. I can’t say that, at a distance of 42 years, I remember the visit as being particularly illuminating regarding “Native American culture” (though in those far off politically incorrect days they were still called “Red Indians”!). The whole “visiting experience” might have been upgraded in the intervening years but I was just left alone to get on with walking around (in unrestricted areas) and the locals kept well away. I have always found visiting US Indian reservation towns a bit like visiting townships in apartheid S Africa. You suddenly seem to have crossed an invisible economic frontier into another country and in 1963 the relative poverty showed – the pueblo had no souvenir shops in those days as far as I could see but plenty of beat up old pick up trucks. Hopefully, “progress” since those days with regard to native rights, the growth in tourism and the building (just outside the Pueblo) of the obligatory Reservation Casino has brought increased wealth to the Pueblo. The Taos area has long attracted artists (D H Lawrence lived in nearby arty Taos city in 1925 and indeed his ashes were taken there by his wife), new-agers and their ilk. Taos Pueblo supports this culture and the perceived wisdom that Native Americans live in harmony with the Earth and achieve spiritual fulfilment. You may get a buzz from being close to all this. Personally if I had to choose between visiting “Native American” structures at inhabited Taos Pueblo or ruined Chaco Canyon I am afraid I would choose the latter! We visited on Christmas Eve 2006 and had a wonderful experience. The Pueblo generously did not charge its usual admission fees that day, although prohibited the use of cameras. We arrived around 1530 and were provided an unofficial tour by a resident working for tips. He provided a good deal of historical insight, although discussions about the native faith of the Taos Pueblo people were declared off-limits. He did provide some insights into the flavors of their own practice of Catholicism that stem from the original religion. The tour was limited to the outdoor areas. He directed us to a number of the "shops" that were open selling Pueblo-produced breads, crafts, and souvenirs. The most impressive offered a wide range of contemporary art and pottery from Taos Pueblo and a number of other Pueblos. Most shops offered goods of a high level of craftsmanship rather than souvenirs. The church was open to visitors for the evening service, although could in no way accomodate even a fraction of the people who had gathered by 1700. As a note, there were eventually more than one thousand people there in my estimation (perhaps 2000), so do arrive early in the day before the nearby parking is full. After the evening service, there was a procession featuring the Virgin Mary, native dancers, riflemen, and many residents in Pueblo dress. To light this procession, there were literally one hundred bonfires of locally gathered "greasewood" (an intensely combustible but highly smoky wood). Most of these bonfires were 1-2 m tall, but the tallest two were at least 8-10m, which were quite impressive. The Pueblo residents were very gracious hosts and remarkably welcoming for this event. This was a good experience, and offered some genuine insight into Pueblo traditions. Dress warmly, as you will be mostly outdoors for hours. From "Pueblo de Taos" to "Taos Pueblo"
Role of Women: An exceptional example of a matriarchal society where traditionally homes and farm lands have been owned by women only. Seasonal WHS: Late winter to early Spring the Pueblo closes for about ten weeks. - Official Taos Pueblo website. This closure is due in part to both seasonal and resident accommodations. Customary ownership: Individual components of the Pueblo structures may be owned by or assigned to families or individuals but in its entirety, is owned by the community as a whole. ... As such, management is under the Pueblo’s governing body that includes the Tribal Council.